A composite or tooth-colored filling is used to repair a tooth that is affected by decay, cracks, fractures, etc. The decayed or affected portion of the tooth will be removed and then filling with composite resin. There are many types of filling materials available, each with their own advantages and disadvantages. You and your dentist can discuss the best options for restoring your teeth. 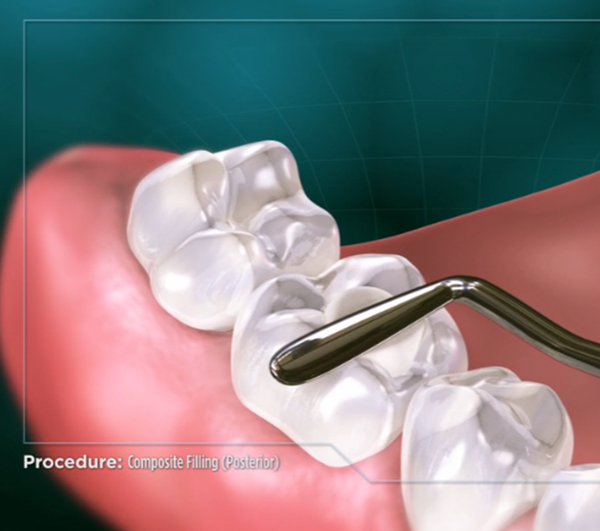 Composite fillings are one of the most widely used today. Composite fillings are usually placed in one appointment. While the tooth is numb, your dentist will remove decay or old restorative material as necessary. A rubber dam is sometimes utilized to prevent old filling material from being swallowed and to keep the tooth or teeth isolated during the filling stage. The space will then be cleaned and carefully prepared before the new filling is placed. If the decay was near the nerve of the tooth, a special medication will be applied for added protection. The composite filling will then be placed, shaped, and polished, restoring your tooth to its original shape and function. It is sometimes normal to experience cold sensitivity for the first few days after a composite filling is placed and this will subside in time as you adjust to your new filling.